Tech and Trains | A Blog on my enjoyment of Networking, Tech, and Trains. In a previous post, I was showing how to setup a CentOS Multinode Openstack. In this post, I’ll show the same thing except I’ll use Oracle Linux 6.6. OpenStack on Oracle Linux has a few different variants, but in this post, I’ll use Oracle Linux as the Compute Nodes. An alternate would be to use OVM which is Xen based as the Compute Nodes. I’m going to skip the steps for getting GNS3 setup since it is the same as my other post at part 1. When you get to the section where you start to configure the eth1 interfaces and the yum repos, stop there and come back here. The instructions are very similar to our previous setup except for a few changes and command line argument differences. As a reminder, here is the setup we built. On the controller, do the following. Update the /etc/hosts with the hostname of the nodes. Restart networking to pick up all the settings. Now we will do similar setup on Compute node 1. And finally we will do similar setup on Compute node 2. Next we need to do some patching on the control node. Edit the /etc/httpd/conf.d/15-horizon_vhost.conf and add a ServerAlias for your public IP. If the value is higher than 2.48-13.el6.x86_64, you need to downgrade using the following command, possibly more than once. Similar downgrades will also need to be done on both compute nodes and for both dnsmasq and kvm. If the value is higher than 0.12.1.2-2.415.el6_5.14.x86_64, you need to downgrade. Possibly more than once. This post ‘Multinode OpenStack with Oracle Linux 6.6 in Virtual Box with GNS3’ first appeared on https://techandtrains.com/. In my last post, I did a simple All In One installation. Now we are moving to the next step and creating a multinode installation where I have the following three nodes. The steps to put all this together are long, so I am splitting this post into part 1 where I put together the infrastructure and part 2 where we will install OpenStack on the nodes. The following instructions are for installing a multinode OpenStack Icehouse on CentOS 6.6 in VirtualBox and GNS3. For CentOS, I started with the CentOS 6.6 Minimal DVD to keep the footprint small. I am also using GNS3 version 1.3.2. I created three Microsoft Loopback interfaces on my host PC and created a bridge with 2 of the loopbacks and my PC’s NIC. I renamed the looback interfaces to Loopback1, Loopback2, and Loopback3. To have the nodes have access to your network/Internet, I created a Bridge on my PC and added my PCs Ethernet port and also included Loopback1 and Loopback2. For Loopback3, I am going to use that as my management access from my PC into the OpenStack management network. Using Windows, configure Loopback3 with IP address 192.168.0.100/24. Using VirtualBox, create 3 VMs. For the interfaces that will be used by the multinode setup, the following are the interfaces used in each node. Using GNS3 and some GNS3 Ethernet switches, we will create the following topology. I could have done all this with less switches, but I used separate switches for each segment to keep it more clear what was happening and also that GNS3 isn’t very good at drawing the link lines in a nice pattern. So here are the switches that will be used. Tenant VLAN: This will be the switch that connects to the trunk ports on the nodes that use VLANs for tenant traffic isolation. Mgmt: Ethernet network for OpenStack to use for managing all the nodes. Tenant Public: Interface used by the tenants for internet access with floating IP addresses. Server Public: Interface on each node for us to manage the nodes such as software installation and such. Add the switches to the GNS3 canvas. Next, configure each switch as follows. Mgmt: Configure all port as type ‘access’ with VLAN 1. 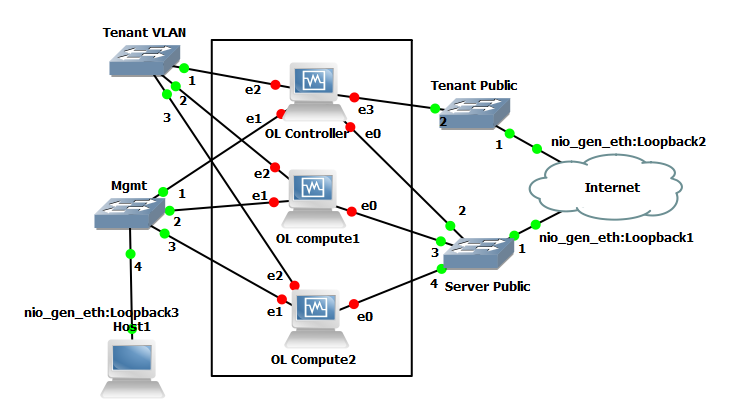 Tenant Public: Configure all port as type ‘access’ with VLAN 1. Server Public: Configure all port as type ‘access’ with VLAN 1. In GNS3, import the three Virtual Box VMs. In the GNS3 preferences, under the VirtualBox VMs page, click on the New button and add each of the VMs that you created in VirtualBox. For each also configure the settings. Do not check any other boxes. Check the box that says 'Allow GNS3 to use any configured VirtualBox adapter'. Add the three OpenStack nodes to the GNS3 canvas. Name one Internet and add the Loopback1 and Loopback2 to the NIO Ethernet list. Name the other cloud Mgmt Server and add Loopback3 to the NIO Ethernet list. Now using the GNS3 Link creation, create the links from the switches to the Ethernet ports on the nodes. At this point, all the nodes, switches and links should all be created and should look something like the diagram above. Now before we install OpenStack, we’ll need to get the VMs ready to install OpenStack. Start up all the VMs using GNS3(press the Play button) so all the interfaces get added and we have connectivity between the VMs. Now, at this point, all the nodes are ready to have OpenStack installed. To make sure, you should be able to ping each node using its management IP address using both the IP address and the host names. That’s it for this post. In part 2 of the post we’ll install OpenStack on all the nodes. 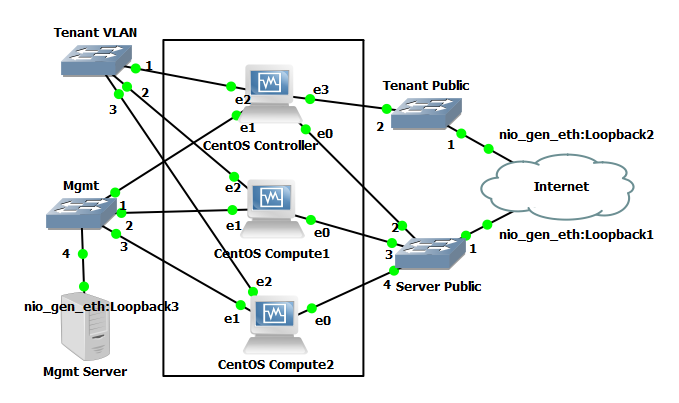 This post ‘Multinode OpenStack with CentOS in Virtual Box with GNS3 Part 1’ first appeared on https://techandtrains.com/.